Push past your limits. Don’t quit. You can do more than you think you can. When you want to stop, that’s when you work harder. Keep going no matter what. Do more than you did yesterday. Pretty common mantras floating around the fitness world, eh? You can’t go on Pinterest, browse through Instagram, or follow a fitness associated Twitter account without seeing things like this on a daily basis. For most people these things are encouraging…even motivational! For me though, I’ve come to realize the importance of NOT pushing myself. Let me fill you in on my typical workout routine nowadays. It’s boring, it’s routine, it’s structured. Well that doesn’t sound to fun, right? But for me, it’s perfect. As someone who has struggled with having a healthy relationship with exercise and who has overdone it in the past, I have realized that setting parameters for myself, sticking to a consistent routine, and NOT making myself go harder than the day before is what’s best for me. Too often in the past I would fall into the comparison trap. With others, but even worse, with myself. Each workout had to challenge me in news ways, be harder or a little longer than the day before, make me sore in areas I didn’t even know were possible. Not a way a to live. But hey, I thought that my self-worth was based on my pace during a run, being able to edge out an extra tenth of a mile, holding a plank for a few extra seconds, or pushing through the mental anguish of another cardio workout. But not anymore. Nope. I am far removed from that toxic state of mind. Now I know that LIMITING myself is actually what is best. So unlike most fitness folks, I don’t go into each workout hoping to PR or reach a new level of intensity. Instead, I challenge myself by sticking to the healthy boundaries I’ve set for myself. Some of these include, not running double digits multiple times during the week, no longer doing an hour of cardio on machines at the gym, focusing more on strength training, and making sure I get in a yoga practice at least once a week. So sure, my fitness regimen is pretty much the same week to week. Meaning I know what I do on certain days and how much time I’ll dedicate to working out. But ya know what? That’s okay. Sometimes it’s more rewarding to not constantly be pushing yourself. Of course I still like to physically challenge myself during workouts…I love those endorphins! But I get an even greater high on the days when I am able to successfully combat the voices in my head telling me to go a little longer, go a little harder, or that I am not doing as much as so-and-so. When I get through a workout and don’t go overboard…that’s a win. And that’s more rewarding than any PR or ‘new level’ I could reach. I am about reaching my next, my best level of health. Staying happy physically and mentally is all apart of that. So here’s to resting when you need. Taking a break when you feel like it. Going easy and cutting yourself some slack. To realizing when something isn’t serving you. To being okay with ‘quitting’ (it’s not the end of the world if you decide you’re not feeling a workout today!). To comparing yourself to no one…including who you were yesterday. And to living for more than physical measurements of success. Do you find yourself constantly trying to push yourself in terms of fitness and exercise? Do you thrive more when you have a set routine or more spontaneity? Do you ever compare yourself to YOURSELF? Linking up with TOL and Jill. I’ve heard that’s a good total body program! I do like the idea of having a set schedule with daily workouts that are already lined up for you! Thanks Alyssa! Glad you got something out of this! ? Nice post! I often feel a bit conspicuous at spin class, for example, when I have to take break or take my gear back down, even though the instructor says to take it up. It’s really important to be aware of what your body can and will do; sometimes I feel like pushing myself, but I also have to be aware when I need a break. Yes yes yes! 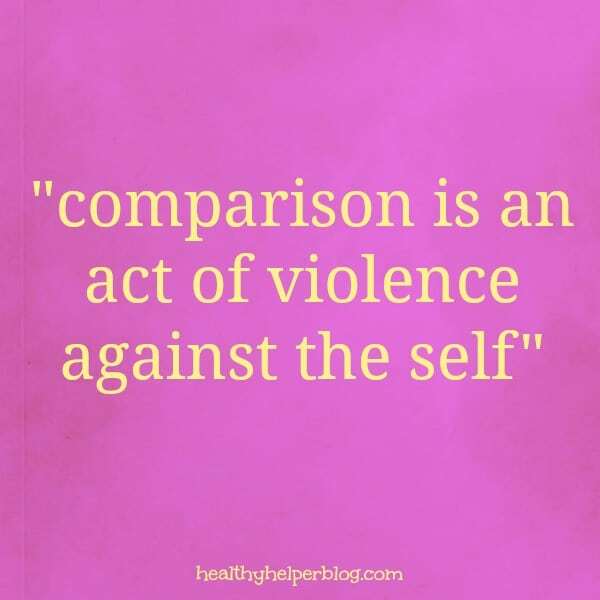 We have to be careful not to compare ourselves too harshly to ourselves or others! Thank you so much Nat! It means a lot coming from you! I love your balanced approach! I follow Blogilates YouTube videos for my workouts, so I do like to try to challenge myself to completely finish them. But if I don’t, that’s okay too. I need to have compassion for myself on days I’m not necessarily feeling my best because they will happen. I think the most important thing is not to tie your entire self worth into your fitness ability (or really any ability, since no one is perfect at anything). Thanks for the reminder. I like your approach too! Very mindful of your needs and your body’s wants! I’m a creature of habit and I like a set routine! When I was younger I used to exercise every day for hours on end but nowadays I try to exercise every day but occasionally I go for a walk instead and don’t beat myself up about it! I found a workout circuit on Pinterest , of all places, which lasts for about 20 mins and I have one of the Apple Music Workout Music combination s on whilst I do it – it’s enough of a challenge to keep my heartbeat up but I am able to complete it, which makes me happy! ? Quick and efficient is what I like too! Such a great post! Now that I’m pregnant I keep trying to remind myself that not only should I not push myself, but I should take it easier than normal for the health of my baby. Thank you for the reminder that listening to my body is the best thing I can do. I needed this today. Definitely been pushing myself too hard 🙂 great article! I couldn’t agree with you more on this. I’ve had to completely cut back on working out because of my job, but it’s been so good for me. Now when I get the chance to exercise, I actually enjoy it! SAME HERE but it’s because of school for me! But like you said…it’s been a good. A needed change! As someone who is recovering from injury, this is so important for me to remember! Thanks so much for sharing this message! So happy this message reached you! Sending you healing vibes! A voice of reason! I appreciate your perspective here! Thanks! Same here girl…SAME HERE!! But like you said it’s so important and necessary! Just gotta keep working on it. I think it’s easy to get discouraged and quit if you constantly try to match what others are doing. You are right to find a routine that works best for you and stick with it. Agreed! It’s about clueing in with what works for you and YOUR body! Hi Kaila, I couldn’t have read a better post right now, as I opted out of going for a run this morning as it’s too cold/ too windy/ too hot/ going to rain…. Let’s face it I just wasn’t going to go for whatever reason. I go through phases with my working out. I do genuinely like to workout several times a week, whether it be running, walking or strength training, but am I aiming for personal bests? Not really. I’m just addicted to the happy hormones that exercise releases and I don’t always have to push myself to be rewarded with them. So I’d like you to know that you’ve made one lady very happy. I’ve not worked out and as it’s Friday had some Cadbury’s fruit and nut for breakfast and for today, it feels good. It’s so hard to find the right balance between doing enough and doing too much. People who aren’t active at all pay need a push, but others like me need to remember that there is such a thing as too much! Exactly! Too much of a good thing definitely exists! Great post! I get frustrated when I see those kinds of mantras everywhere. While there are times I do push myself, I have found that its best to go easy most of the time. Pushing yourself too hard every day can definitely lead to burnout or an unhealthy relationship with exercise! Agreed! Sometimes it’s best to take a step back and take things down a notch! Our bodies will thank us for that! I almost always have a set routine. I prefer it that way. I’m comparing myself less and less often. Boom! That is AWESOME to hear Jill! You go girl! It is so great to finally read a post like this! I usually skip past any exercise post because it is all about “pushing yourself” but I’ve also ventured into the unhealthy as far as exercising in the past. Keep up the great work – you know what’s right for your body! I agree, you know what your limits are, so be smart about them. Sometimes we push ourselves past what is good and healthy. Just getting the workout in is pushing ourselves some days, be happy with the accomplishments you are making. You and your body will know if you need to move forward or take a step back. Listen to yourself! YES!! Listening to yourself and your body is KEY. I am so happy you enjoyed this post! Definitely a good one to refer back to! I’m all about this girl. My limits and my goals are just that – mine. Doesn’t mean I won’t cheer on another gal at the gym but I always remember that she’s doing HER thing. That’s not me and I’ve got my own motivation. Thanks sweet friend! I am happy you liked the post! I love this post! I admit that I have an on again off again relationship with exercise at the moment, but it’s because of my constant battle with myself. I own and use a Polar heart rate monitor when I would workout 5 days a week. I logged each and every workout; time, heart rate, calorie burn, etc. I logged those numbers and tried to out do myself every single time I would workout. And you know what? In the end all I did was set myself up for failure and burn out. It wasn’t fun. I was missing the whole reason behind working out to begin with. But battling myself is a constant struggle. I need to take a step back and not worry so much about those numbers, and my need to increase them everyday. Thanks for the encouragement to step back from my Polar the next time I workout. I guess if I don’t have numbers to compare, I can’t strive for harder the next time. Thanks for linking up with us at The Wednesday Showcase! Thank you so much for taking the time to comment! It’s funny you mention your HR monitor because I have a whole post coming soon about why I stopped wearing mine! You’ll love it! Thanks for hosting the linkup as always! Good timing. I’m just linking up to My Favorite Things and scrolled through the others to see yours. I’m heading out to the gym, where I’ve been forced to go for the winter. I started running about 6 months ago, and while I used to HATE running or any form of exercise (swore I was allergic), I actually found that I enjoy it. BUT…I fall into that trap-always having to push to the next level. Otherwise, it gets boring. So, while I’m training now for a 10K, I have no desire or plan to actually run a 10K race, but just want to build my endurance. Knowing that, sometimes I have to give myself a break and just not do that day’s training and just run instead, or take a hike with my husband, or take the dog for a brisk and long walk. It’s all exercise, and I don’t want to push myself even though my inner self tells me to. Thanks for a timely message. So welcome! I am glad it reached you when you needed it most! I really love this! I have struggled with this in the past-feeling like I need to push myself harder and harder and more and more. It usually ends up with me getting some sort of injury that takes me down for weeks or even months because I didn’t listen to my body and stop when it was telling me to. I’ve learned that rests are ok and if I’m really not feeling up to it, its just fine to not do a planned workout, as long as its my body telling me it needs a rest, not my mind telling me to be lazy! 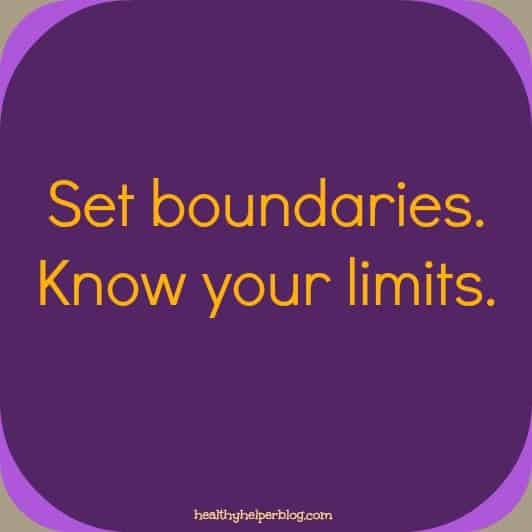 Setting boundaries is so important and known your limits is important too. Thanks so much for sharing this with us at Savoring Saturdays linky party. I totally agree! Thanks for sharing your thoughts!